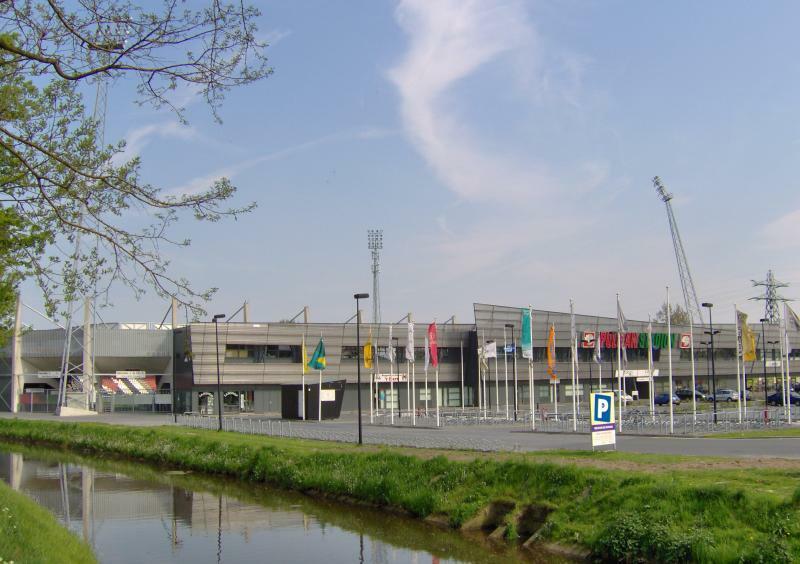 Polman Stadion, which replaced Heracles’ old stadium on the Bornsestraat, opened on 10 September 1999 with a league match versus FC Zwolle (1-1). It was the first stadium in the Netherlands to have a pitch of artificial turf. 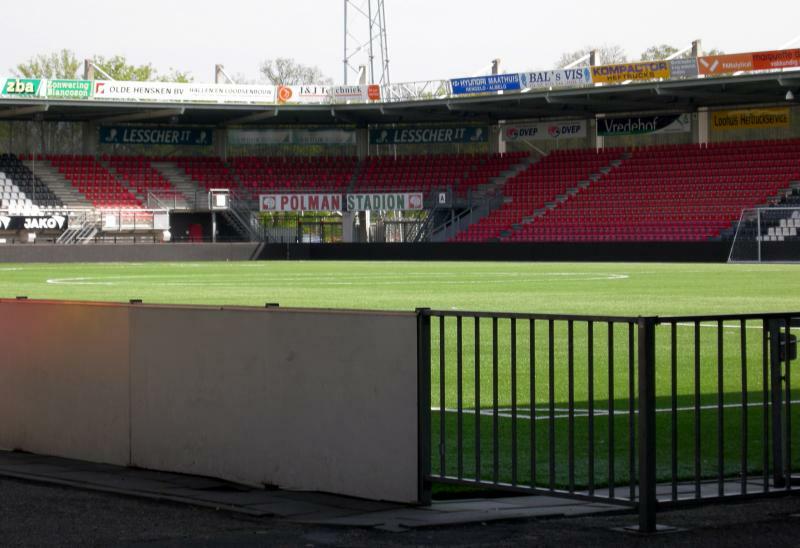 Polman Stadion could initially hold 6,900 seats, but after the club’s promotion to the Eredivisie in 2005 a further 1,600 seats were added by extending the stands on the long sides down to pitch level. Heracles, however, kept selling out in the Eredivisie, and therefore soon after started investigating the options for further expansion or building a new stadium. Initially, the club preferred the latter option and plans were presented for a new 15,000-all seater stadium, called the Ten Cate Arena. However, these plans fell through as the club could not get the approval for the retail space that was necessary to fund the project, and therefore attention shifted to expanding the Polman Stadion. In March 2014, the club finally received the go-ahead for the expansion that would add a second tier to the stadium and raise capacity to just over 12,000 seats. The expansion was completed at the start of the 2015-16 season. Polman Stadion is located in the south of the city of Almelo at about 2.5 kilometres from the city centre and central railway station. The stadium can be easily reached from the A38 motorway that runs south of the city (and connects with the A1 slightly further east). Take exit 30 Almelo-Zuid, and take the N349 toward the city. Follow for about 2 kilometres until the crossing with the city’s ring road. Turn left following the sign for Stadion. The stadium will lie directly after on the right side of the road. Buses 21 and 22 connect the stadium with Almelo’s central train station and city centre. Take the bus in the direction of Windmolenbroek and get off at stop Stadion (line 21) or Nieuw Witvoet (line 22). The ride will only take 6 minutes and buses generally leave every ten minutes. Tickets for Heracles matches can be bought online, at the Ticketbox sales points, or at the club’s Fanshop at the stadium. Heracles used to require possession of a Heracles Fan Card to be able to buy tickets, but have recently relaxed this requirement and nowadays more games go on general sale. If tickets remain available, these can also be bought on the gate on the day of the match, but the same Fan Card requirements will apply. Heracles sell out most home matches and booking in advance is therefore strongly advised. Ticket prices range from €20.00 for a seat behind one of the goals to €28.00 for a central seat at one of the long sides. Tickets for a small standing section cost €18.00 Prices are increased with €5.00 for a few high-profile matches. For more information email ticketing@heracles.nl or call +31 (0) 546 817070. Heracles.nl – Official website of Heracles Almelo. Vvvalmelo.nl – Website of the Almelo tourist office.